How I refactored my app’s Settings screen code to be much more flexible and readable, while unlocking a more complicated TableView at the same time! Win-Win! I stumbled upon this amazing post by Frédéric Adda over at Nova Era called Structure Your UITableView Better with Structs and Enums in Swift as I was searching for a way to refactor the Settings page in my app, BB Links, to make it easier to add in new settings options anywhere, or change around any items/sections, without needing to manually worry about the section and row index numbers. With this change, I can move any item to any section and change the order of sections and items all within a couple of seconds! To do that with section and row indexes requires a bunch of index changes which can get confusing to keep track of. First, I created the SectionType enum which represents the different sections I want to have in the Settings screen. I have an Account section and Other. Next, I create the Item enum which contains all of the different tableView rows I have in the Settings screen. Lastly, a Section struct is created which is identified as containing a SectionType enum and an array of Item enums. Once those three components were set up, the next step was to create an instance of an array of Section structs, which will hold the various sections in the Settings screen. The Account section contains the ManageAccounts, ActiveAccount and DefaultCountry tableview rows, and the Other section contains the remaining four rows. Next up…the UITableViewDataSource implementation which I have as an extension to my SettingsViewController class. For tableView:numberOfSectionsInTableView:, you just return the count of your sections array, which will be 2 as it contains my two Section structs. for tableView:numberOfRowsInSection:, return the count of items in each section, and for tableView:titleForHeaderInSection:, I setup a switch statement to switch through the types, returning the name for each section. (For Other, I just wanted it to be blank, so I didn’t return a title). // Setup a cellIdentifer string to store the cell reuse identifier you want to use for each row. // The order of the cases is irrelevant! cell.textLabel?.text = "Manage Coach IDs"
cell.textLabel?.text = "Active Coach ID"
cell.textLabel?.text = "About the Developer 💪🤓"
cell.textLabel?.text = "Rate BB Links ⭐️⭐️⭐️⭐️⭐️"
cell.detailTextLabel?.text = "\(reviewCount) people have rated this version"
cell.textLabel?.text = "Share BB Links 🗣👥"
cell.detailTextLabel?.text = "Know a coach who would love this app?" With all of this setup the way it is, adding new sections or rows is a cinch! I could totally rearrange this tableView to look completely different switching a couple of lines of code. The normal way would be way more difficult. 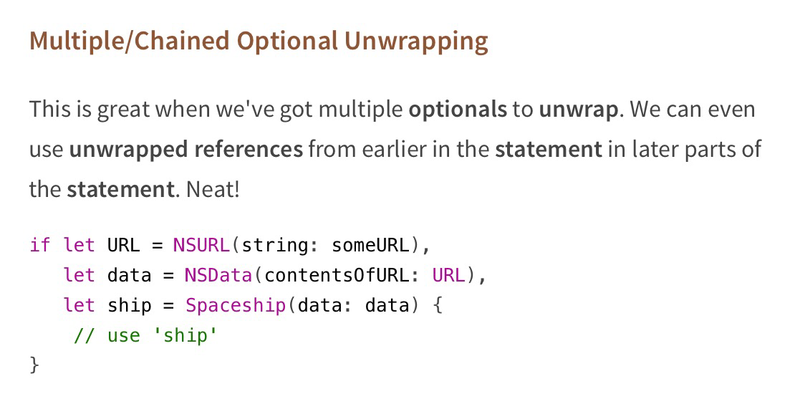 Thomas Hanning outlines how to use the new defer keyword in Swift in his blog post. Essentially, the defer keyword executes its block before exiting the scope it is contained within. It’s a great tool to ensure you do any clean-up code required, even if an error is thrown. It’s almost like a deinit() block for your own functions! Little Bites of Cocoa is a blog I recently discovered that offers some truly great bite-sized snippets of knowledge via a newsletter. It’s a good way to keep on top of new best practices and bits of knowledge. It’s helped me cut way down on the pyramid of doom! And what’s even better is you can even throw in a condition using the where keyword to the end of the chain. 😍 brilliance. Excellent bunch of tips to write Swift better—exactly what I like to see! ‘Guard’ has quickly become one of my favourite way to help simplify my code by getting rid of lots of pyramids of doom! If if if 🙅. Make sure to check it out and try guard out in your code! When coming from an Object-Oriented Programming language like ObjC, inheritance is often used to share code between multiple classes. But that solution is not always the best, and have some issues. In today’s article, we’ll see how Swift’s Protocol Extensions and their usage as “Mixins” can change the deal. via Mixins over Inheritance – Crunchy Development. Check this amazing post out! Some really epic examples to show the power of Mixins (protocol extensions). ❤ it. An excellent post from Thoughtbot about how to make better use of Color in terms of design use (limiting your app to using 3 colours max), naming conventions (i.e. to base names on usage scenario instead of the actual colour, and use aliases), and programming techniques (how to use extensions and global functions with Colors). Some great ideas I’m going to use!